Disclosure: This is a sponsored post. 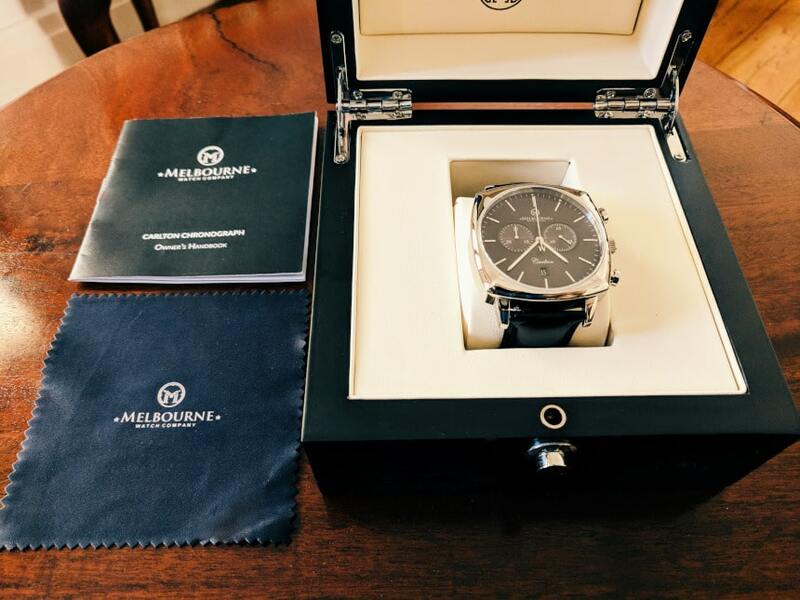 We received compensation and courtesy product from Melbourne Watch Company in exchange for our honest review only. All opinions expressed here are our own. While it sits quite large, there’s a lot to like about the Carlton by Australian watch maker, Melbourne Watch Company. 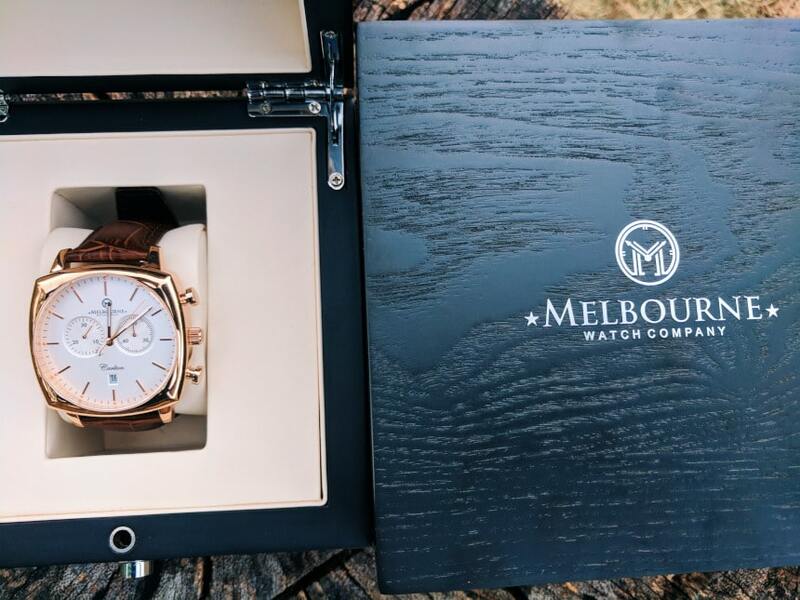 Its high-quality design and specs offer great value for money, while its themed elements work to creatively bring the city of Melbourne to life, right there on your wrist. I’m fortunate to have visited Melbourne, Victoria a few times in my life. It’s a cool city, and up there as one of my favorite places in Australia. To paint you a picture if you haven’t been, I’ve heard it referred to as a ‘mini New York City’. I mean, the fact that ‘Melbhattan’ is a word that has been printed online says something. And you know what? I can see the connection. The diversity. The SoHo-like laneways. The speakeasies. The growing coffee standard. The 24-hour energy. I bring up this comparison to give you a sense of what Melbourne is all about. 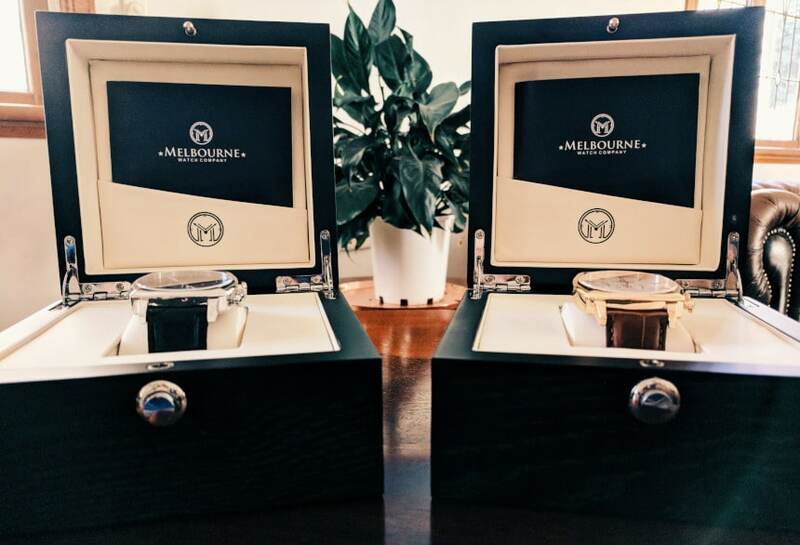 Because Melbourne Watch Company is all about Melbourne. Who Are Melbourne Watch Company? What Are the Differences Between the Classic Rose and the Black? 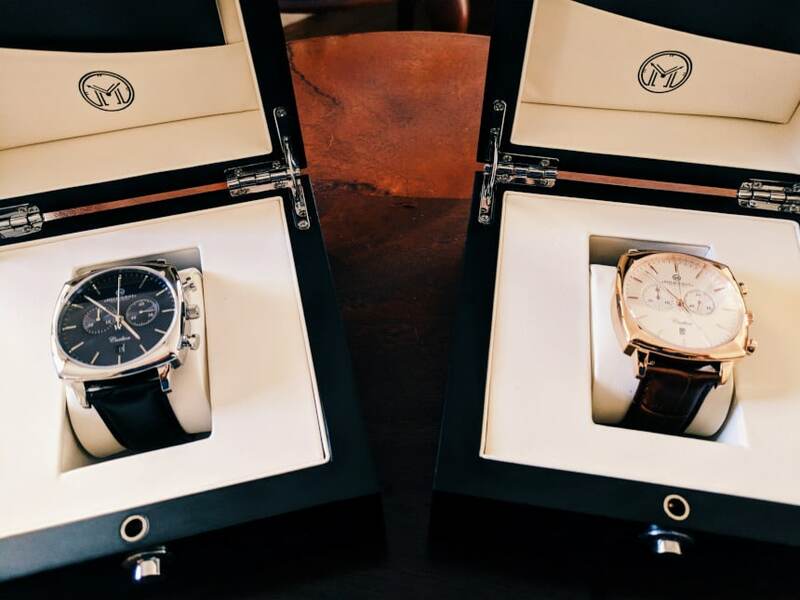 Melbourne Watch Company (MWC) are an Australian watch company based in (you guessed it!) Melbourne, Australia. From the company name—to the name of each collection—to the iconic landmarks on the case backs, the city of Melbourne is the leading influence on the brand’s designs. And because of MWC’s attention to detail, that influence comes through as clear as the sound of a tram screeching to a stop on a cold Autumn morning. I mean that it’s evident. Not irritating. Please don’t send me angry Aussie tram letters. Fun fact—Melbourne operates one of the largest tram networks in the world. And let me tell you, they were a Godsend when I was there as a pathetic tourist. Yes, I nearly got hit by one (it was only once), but they saved me from getting lost at least 11 times. Why don’t more cities have trams? 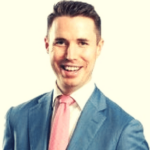 MWC are a crowdfunding success story. Founded in 2013, they’ve rapidly expanded to develop nine collections, with six currently available for sale. 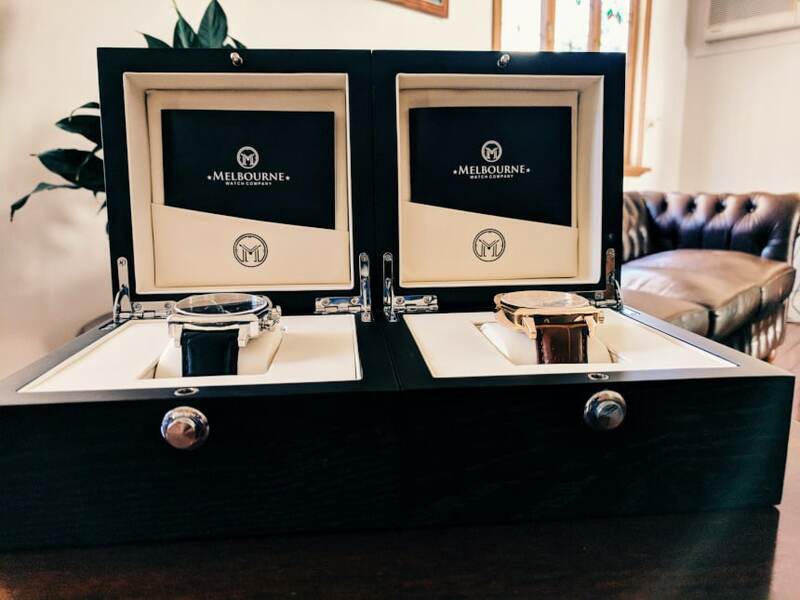 Each watch is designed and assembled in Melbourne. Their showroom and workshop is in the inner city Melbourne suburb of Carlton. And here’s another one for you. The Carlton just so happens to be the name of the model of watch I’ll be reviewing. The Carlton is the brand’s largest model, alongside their dressy diver, the Sorrento. It’s a classic 1960’s style chronograph with a square cushion case. Think late 60’s automotive pieces like the Heuer Camaro. 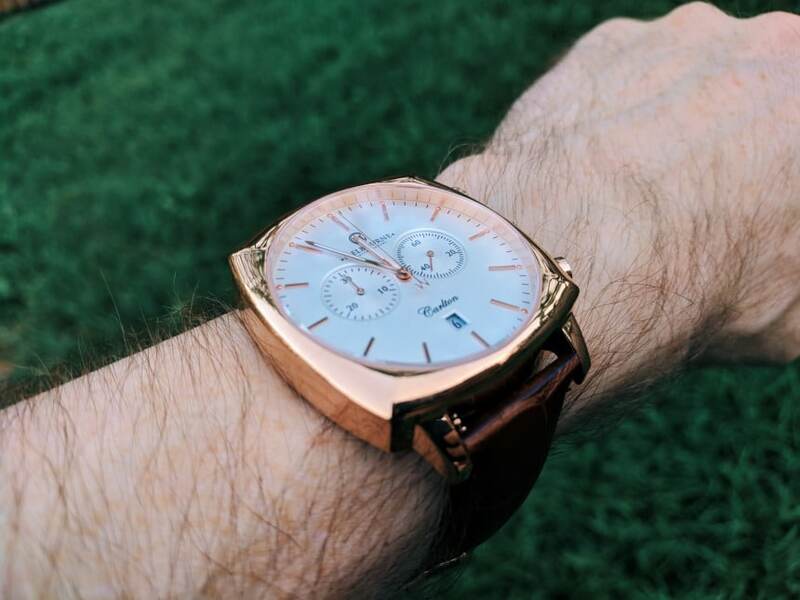 The Classic Rose version features a rose gold plated case and a brown leather alligator strap, with a cream dial. The rose gold is also accentuated on its hands, crown, pushers, markers, and buckle. On the flipside, the Black version is all about the classic black/silver dynamic. It boasts a black dial with a black leather alligator strap. It has a stainless steel case, as well as silver hands, crown, pushers, markers, and buckle. 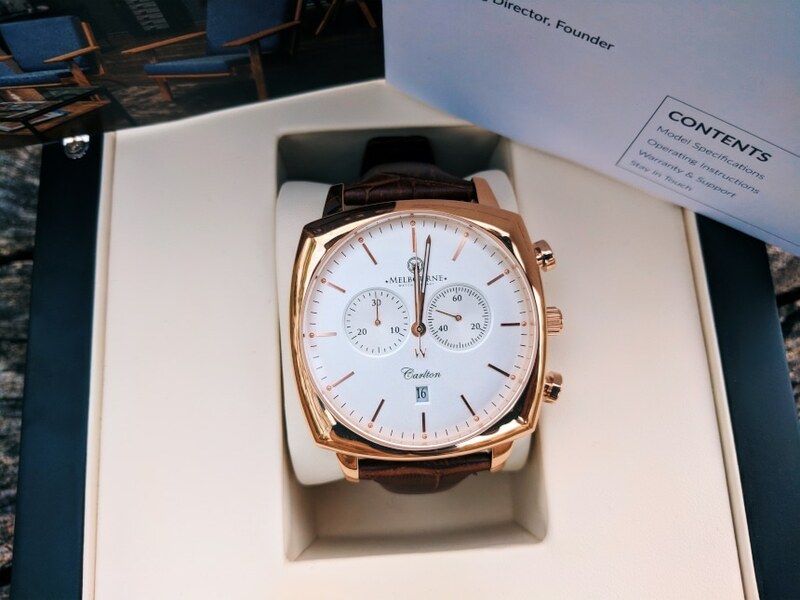 My Carlton watches each arrived snugly packaged in a black square wooden box within an outer cardboard box shell. The box is hinged, with a stainless steel push button lock. Opening the box reveals a model specific owner’s handbook and cleaning cloth tucked into the top of the box. The watch was seated on an ivory cushion with the time and date set accurately to Melbourne time. Classy. I’ve gotta say, I’m impressed with the quality of the box. When you’re spending above the $250 – $300 USD range on a watch, I think it’s fair to expect a nice looking box. I like that MWC have paid attention to that, it makes for a good unboxing experience. I’d be very comfortable gifting one of these in their stock box. Onto the watch itself and the Carlton has a 42mm diameter cushion case made from 316L Stainless Steel. It has a lug to lug length of 52mm and a height of 11mm. The thin width allows it to fit under a cuff pretty nicely. To me personally, the Classic Rose version appears a little bulkier to the eye than its Black counterpart, and that’s probably down to the darker version’s more subdued black/silver contrast. The watch weighs in at a lightweight 77 grams. It feels good on the wrist for its size and doesn’t wear you down. The crown is engraved with a small MWC logo and flanked by two pump style pushers. 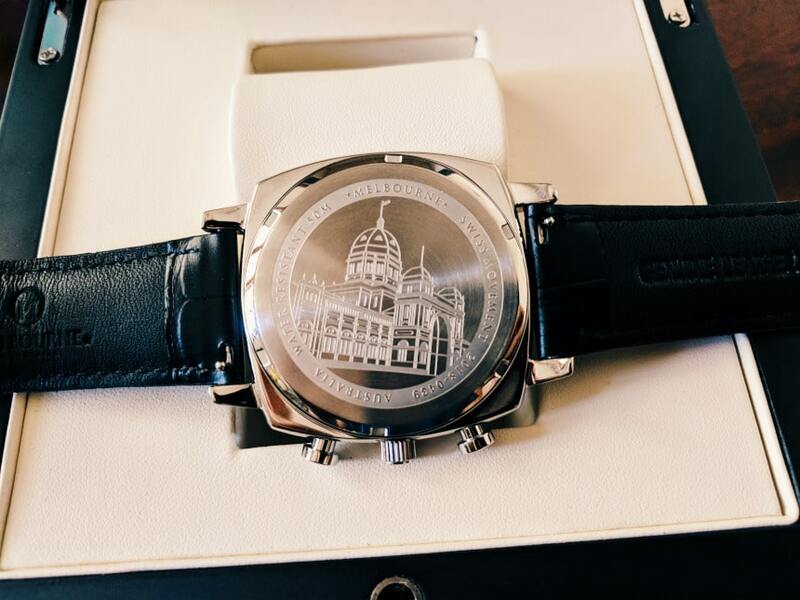 Prominently featured on the case back is a detailed engraving of Melbourne’s Royal Exhibition Building. It’s Australia’s first World Heritage-listed building, and yep, it’s based in Carlton. I like this. 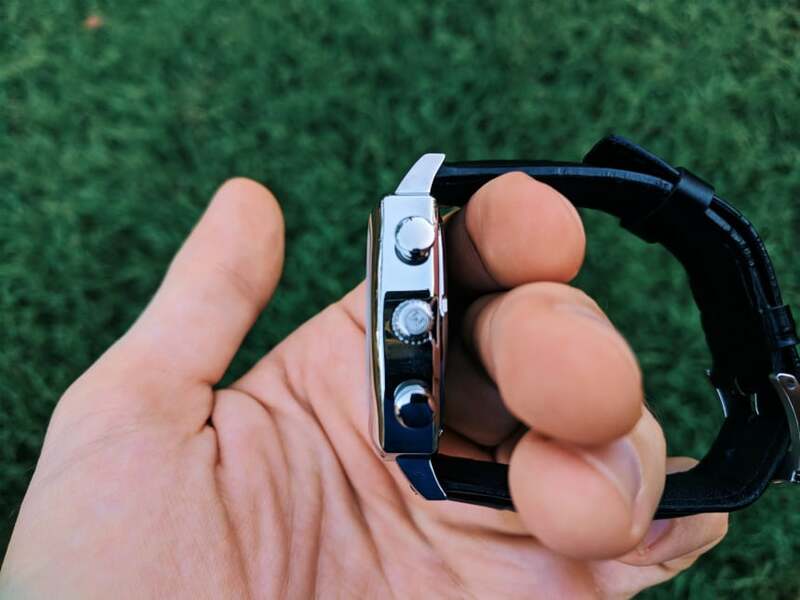 It’s a cool touch that you don’t see on a lot of watches. Themed elements like this add an interesting story to a watch and from a quality perspective, I welcome the attention to detail. There’s also the standard information engraved in a circular pattern around the edge which is nice and tasteful. The case back isn’t plated, presumably to allow you to unscrew it if you want to avoid wear on the neat looking engraving. Interestingly, the Carlton was originally equipped with a meca-quartz movement. The timekeeping component was quartz while the chonograph component was mechnical. It was certainly quite unique for this price point. Now, all newer model Carlton watches are equipped with a more standard Ronda Caliber 5021.D quartz chronograph movement. It’s Swiss and it’s known to be good and reliable. Of course, because the movement on the newer version is now completely quartz chronograph, the main aesthetic difference is you’ll now get the individual tick of the second hand when the chrono timer is on, and the slow wind back on reset, rather than the sweeping motion and snap back you would have previously seen with the mechanical chronograph movement. My guess is the change is down to cost. A quartz movement is generally less expensive than a meca-quartz. 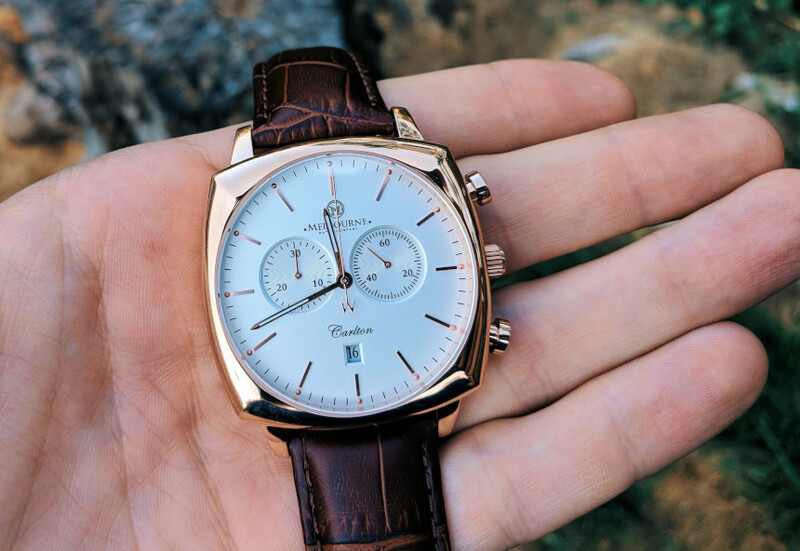 Whether this is a negative for you is really down to whether you have a soft spot for the more analog feel of a mechanical chronograph function. For me personally, I wouldn’t have really expected the Carlton to have a meca-quartz movement in the first place. Yes, the change does mean it loses some uniqueness factor, but I can look past it for this particular watch at this price point. It’s worth noting here that both of my Carlton watches have kept perfect time after a week. The Ronda 5021.D has a standard battery life of 54 months, but this may decrease if you use the chrono often. 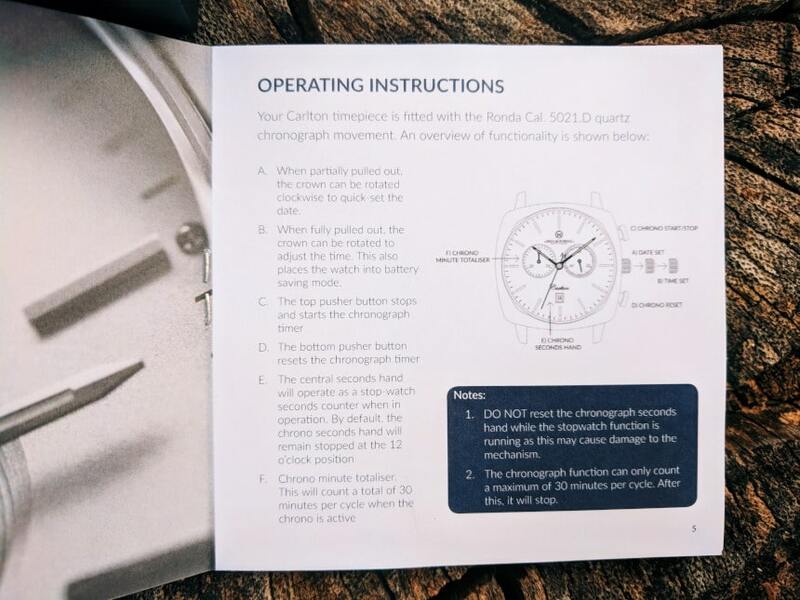 If you’re like me and you like to nerd out on watch movements, you can find its full spec sheet here. In terms of functionality, the top pusher is the chrono start/stop and at the bottom is the chrono timer reset. Start the chrono timer and the chrono seconds hand will begin ticking as a stop-watch seconds counter. When you’re not using it, the chrono seconds hand will remain locked at 12 o’clock. The chrono minutes totaliser sub-dial at 9 o’clock will tally your minutes up to 30. As you’d expect, you adjust the date and time by pulling the crown. It’s easy to pull out and functions well mechanically overall. The Carlton has quite a simple look to the dial with two sub-dials and a date window. I’ve seen some cluttered chronographs in my time, and this isn’t one of them. 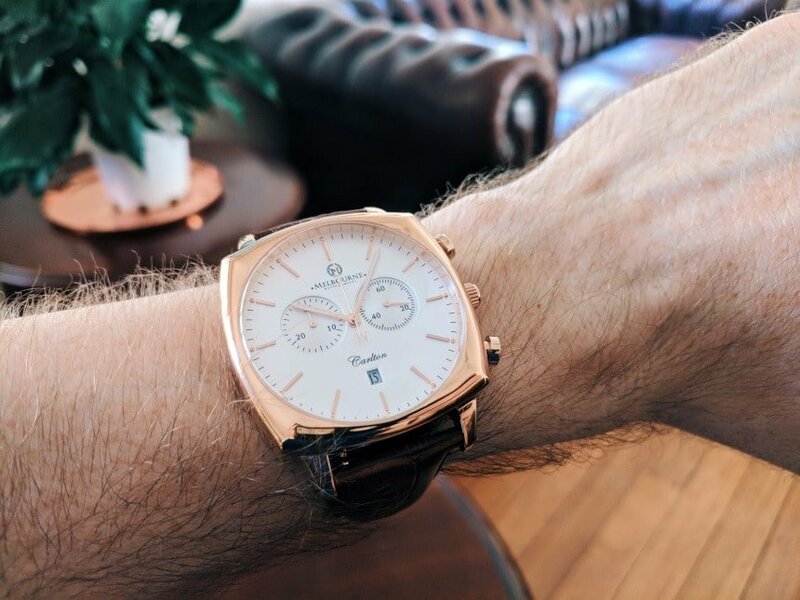 The dial on the Classic Rose is a pleasant cream color which contrasts nicely with the rose gold. The Black version has a black dial and side-by-side, definitely has more of an understated look comparatively. The sub-dial at the nine is a 30-minute chrono timer, while the other is the main seconds hand. The sub-dials have a subtle concentric circular pattern to them which create some interesting reflective effects depending on the lighting. Above each hour baton is a ball—a cool little feature which is consistent across MWC’s collections. 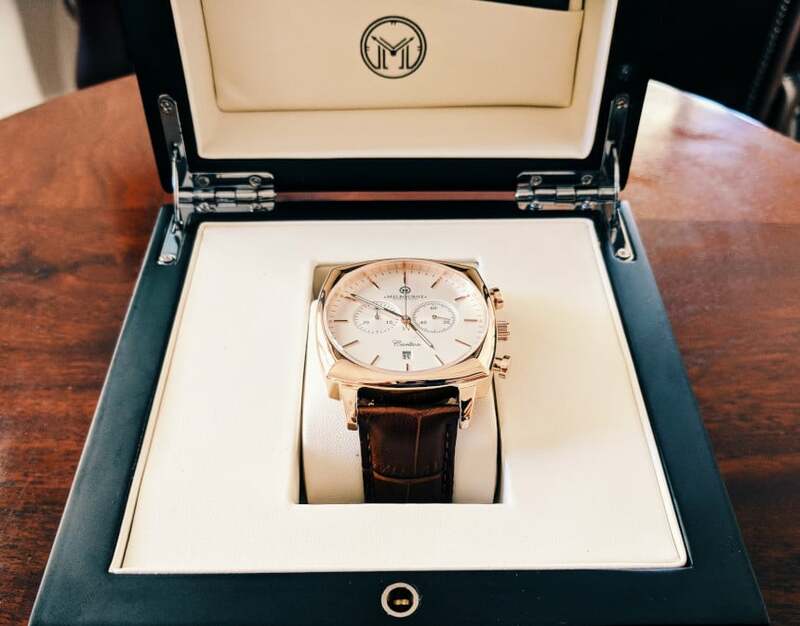 The chrono seconds hand also has the themed “M” logo fixed to the end of it which is another nice branding touch. The MWC logo and the model name are nicely centered and non-obtrusive. Lume is sparse on the Carlton, with a small amount on the hour and minute hands. I tested it—it wasn’t the brightest I’d seen but certainly not the dimmest. 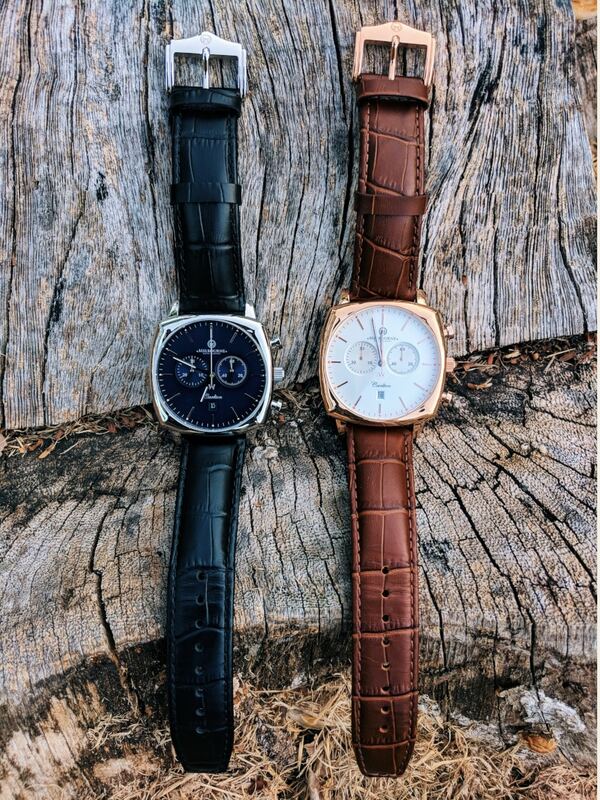 All the polished elements for both watches match with the color of their respective case which helps give them that streamlined classic look. Sitting on top of the dial is a sapphire crystal with anti-reflective coating. The crystal does look stunning and it brings the elegance of the dial to life when you’ve got it in your hands. The watch has a 50m/5ATM water resistance. You’ll be fine for light submersion. But I wouldn’t go swimming in it. It just ain’t that kind of watch. The Carlton comes with a leather alligator strap. The color varies depending on the variant you choose. The strap is 22mm at the lugs tapering to 20mm at the buckle. 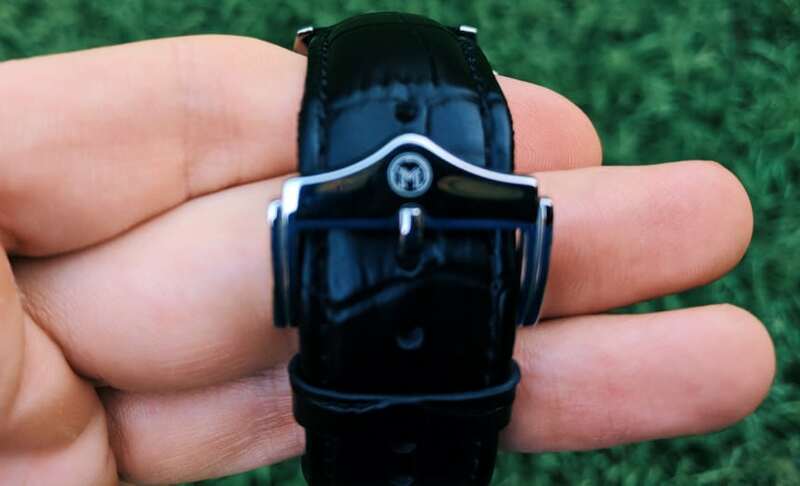 The buckle has an “M” logo branded onto it. Its color is consistent with the case for each version. The leather is supple out of the box and feels great on the wrist. It’s a quality band, I must say. The design is simple but classy. The case style adds variety to my collection and I’m a fan of the 60’s influenced style they’ve drawn from. It’s very well made with an elegant touch and high attention to detail. 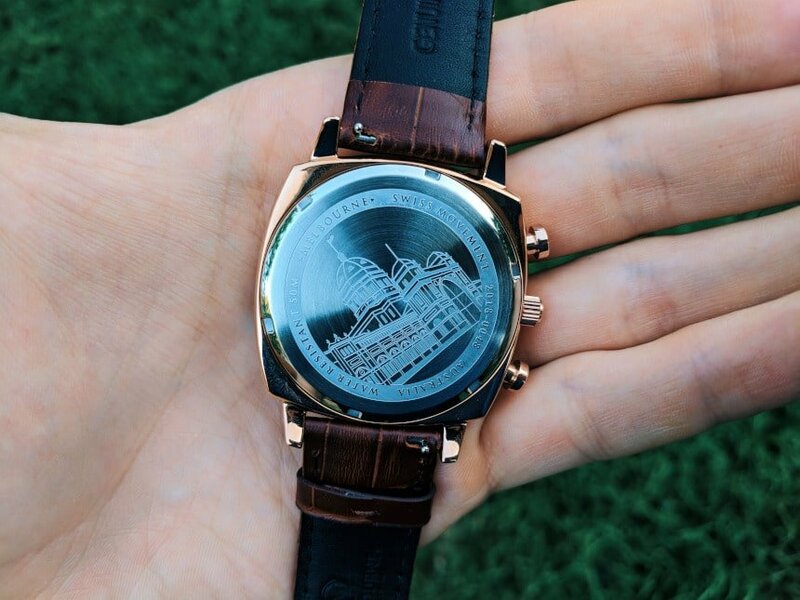 The case back engraving linking the model to the suburb of Carlton is a nice touch. I also like the brand consistences which link all of the MWC collections together. There’s clearly been a lot of thought put into the design of the Carlton, which really elevates the quality. At under $350, you get really good value for money for the specs and overall quality. It comes well packaged in a great looking box. Personally, the Classic Rose sits quite large on my wrist. I’d be interested to see what a 40mm version would look like. The Black version is a bit more subtle to the eye. The lume could be slightly brighter to account for how minimally it features on the watch. As you’ve probably figured out, I’m a fan of this watch. There’s clearly been a lot of love and care poured into the design of the watch. It simply has a high quality feel overall, and it all starts when you first open the package. Personally, I prefer the Classic Rose version with the brown band over the Black. I’ve always dug the rose gold/cream/brown leather dynamic. I wear brown leather shoes a lot and this probably plays into my bias. In saying that, both have enjoyed their fair share of wrist time so far. 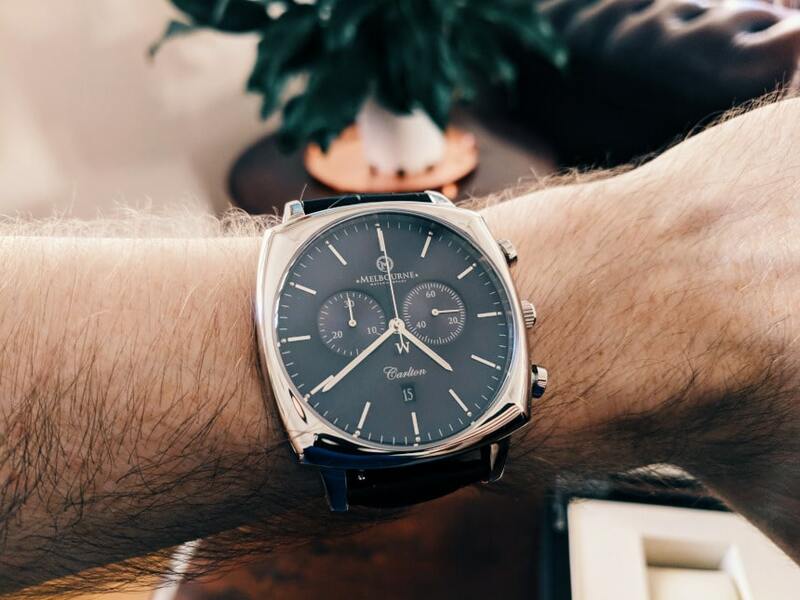 If you like 60’s chronograph styling and you’re shopping in the $300-350 USD ballpark, you’re getting great bang for your buck with the Carlton. If you’re interested in the models from this review, you’ll find the Classic Rose version here and the Black version here. MWC offers free shipping internationally on any watch purchase. 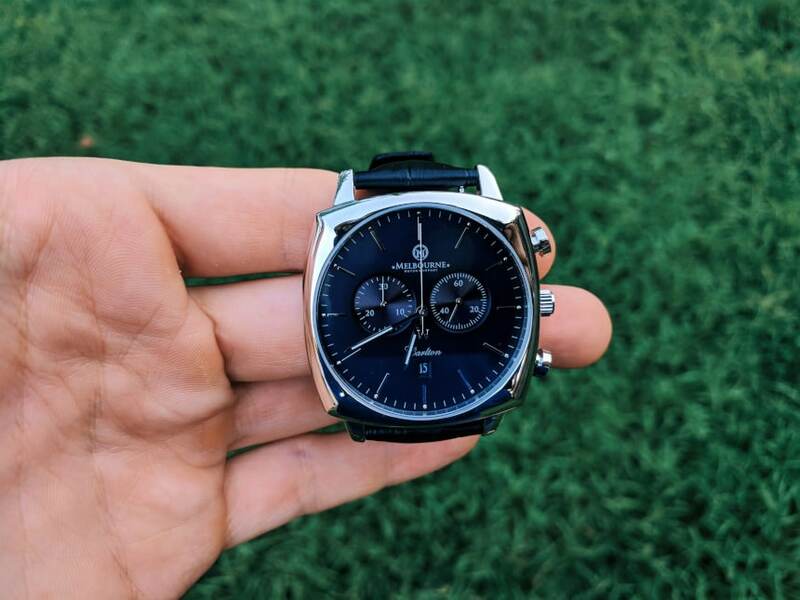 Their watches come with a 24-month warranty which is a fairly standard length. If you’re in Melbourne, you can book an appointment to MWC’s showroom and workshop in Carlton. They’ll walk you through their collection personally over a complimentary coffee or tea. 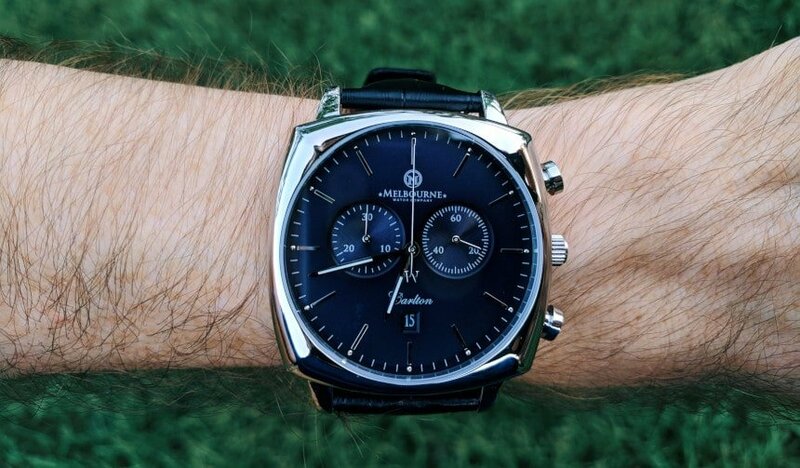 Yes, this review is my first foray into the world of Melbourne Watch Company. But it’s not my first into the world of Melbourne. And after having visited this uniquely Australian city, I can understand and appreciate what the brand is trying to do. And to be honest—I’m quite impressed with how they’re delivering on it. And it’s not only because of the quality and care they’re clearly giving to each of their watch designs. 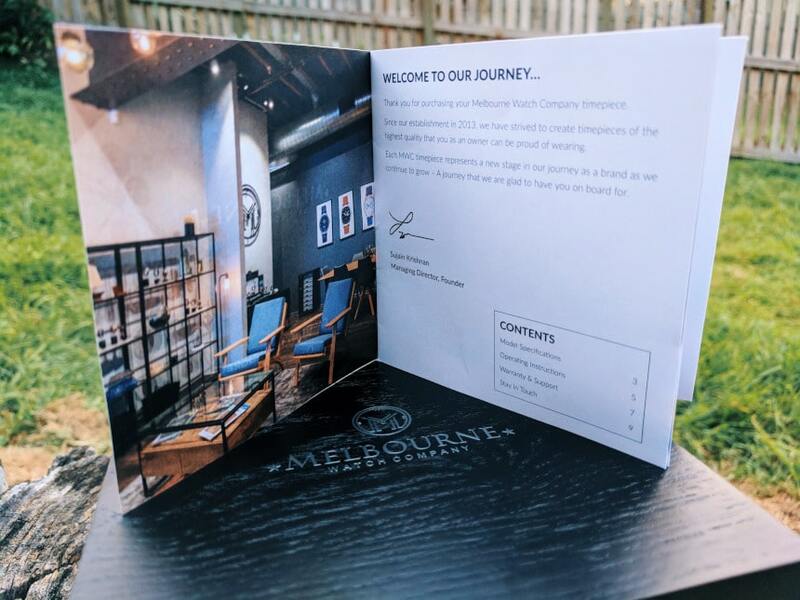 But it’s their branding elements and Melbourne theme—consistent across all their models—that has me forming a new connection with MWC as a brand and building on my connection with Melbourne as a city. And I’ve enjoyed the experience. If you’re a fan of quality, classic looking watches at a fair price point, I think you will too. Now, when’s the next tram?